Want to accurately control the temperature in your home? Work with industry-leading Annapolis hydronic system experts. Call Heidler, Inc. today at (410) 268-7191 and we will provide you with the best options in home heating efficiency. Click here to view our current specials and discounts. Maintaining a comfortable temperature in your property can become a challenge when winter comes around. Freezing weather can affect the efficiency of even the toughest boiler. Can you count on your boiler for another winter? By installing a hydronic system, you will experience far more efficient heating in your home that will give you greater control over your interior temperature. Heidler, Inc. has the solution you can rely on. Click here to see what your neighbors are saying about their experiences with us. Hydronic systems work by moving heat from where it is produced to where it is needed. This happens through convection currents in water. Think of the water as a conveyor belt. The hydronic system takes the heat from the point of production to the final destination, where it is emitted through heating coils into the room. Because the system is known for accurate heating, many customers favor hydronic systems over traditional heating systems. Cleaner air: Because hydronic systems heat the surfaces within a home rather than the air, there is little to no circulation of dust or particles. This is particularly beneficial for those who suffer from respiratory issues or allergies. Zoned heating: Each area of the home can be customized to a different temperature, rather than having the entire home set to the same temperature. Quieter operation: Hydronic systems are also quieter, since there is no ductwork or fans involved to generate sound. Specific heating: Because the system can be installed nearly anywhere in your home, many homeowners use their hydronic system to heat tile or wooden floors. This eliminates that common winter sensation of stepping onto a freezing floor first thing in the morning. Hydronic systems only use 60 to 80 percent of the energy typically required of traditional heating systems. Because of this, you can expect savings of anywhere from 20 to 40 percent each year over the life of the unit. We work to build a bond with our customers, and our skilled technicians will treat your home with the same care and respect they would their own. 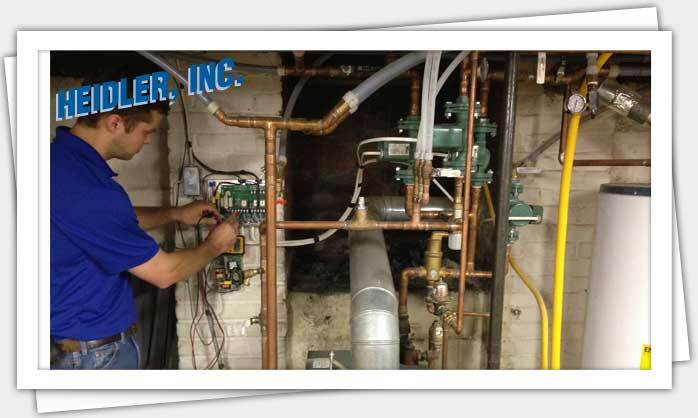 Heidler, Inc. handles all installation, repair, and maintenance services for your hydronic system. Save up to 40 percent on your heating bill. Install a new hydronic system with Heidler, Inc. today by calling (410) 268-7191. You can always expect upfront rates and solutions tailored to your specific heating needs.